The Modern Boy comic, from 1928 to 1936. Homepage. This page: 'The Schoolboy Speed Kings' story by Alfred Edgar, and the Opel Rocket Car. An issue of The Modern Boy comic from 1936. As well as collecting old children's annuals that have a motoring theme to their cover illustrations, I try to find copies of early comics too. They don't turn up too often, but when they do they can have great covers to them. The first one I found was a copy of Pluck, from 1923 (and can be seen on this page), with two daring drivers racing head to head on the Brooklands banking. "Two hundred boys were jammed on a corner of the road through Archer Park, hopping with excitement as they watched a Bugatti roar into the turn. It came up howling, shuddering under the brakes as the driver crashed them on. Two hundred boys from Hambledon College let up a yell as the tail of the blue car slashed around, their shout drowned by the skittering rush of straining tyres and the screech of brake-shoes. The car shot nearly broadside, tearing dust and stones from the road surface .... "
And so the excitement continued, as the fictitious race unravelled before the spectators' eyes, over the next five pages or so. The next story in this comic also has a motoring theme to it, with an illustration showing some bounders in an open-topped motorcar speeding along, being overtaken by the boys in blue (Police) in their fixed-head saloon car ... "The blue patrol car passed them and slowed down. A gong clanged, and a wooden arm shot out of the side of the car bearing the words 'Stop - Police'. Hugo smiled and slowed down. The trick had worked!" "Neither of us can fly - but the great advantage of the Flea is that you can teach yourself to fly it by taxi-ing around the ground and getting used to the controls, which are simpler than on an ordinary plane. To obtain a pilot's licence you have to be seventeen and in good health. We are both still at school, and not quite seventeen. But we soon will be." Inspiring, if slightly scary stuff! The final stories, designed to keep young Norman reading by candlelight long after he should have gone to sleep, include one about a dogfight between fighters during WW1, and a story about some unfortunate souls imprisoned deep below the frozen surface of the moon - all eye-opening stuff for a young lad in 1930s Britain. Even if the tales were quite far-fetched, it makes you wonder if reading these comic books ignited more interest and curiosity in the minds of children, than the kids today who spend hour upon hour sat in front of a TV, or glued to some inane computer game? many weeklies were available for youngsters like The Modern Boy and Pluck, and slightly older children could transfer their loyalty over to a title such as the Meccano Magazine, again were packed with interesting articles and stories. 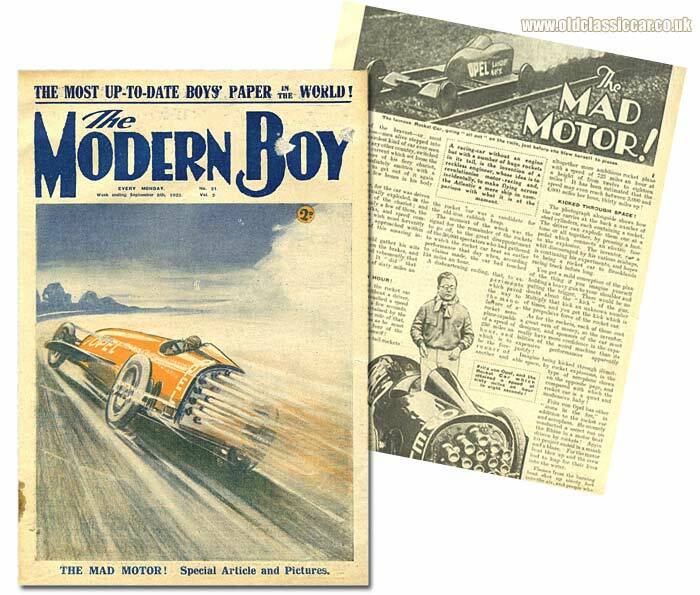 The Opel Rocket Car features in a copy of The Modern Boy from 1928. 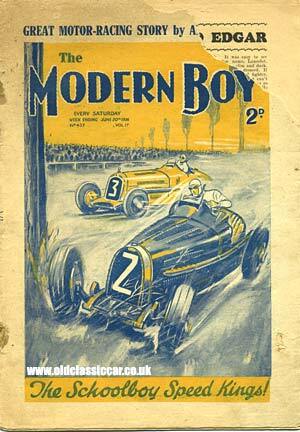 This next issue of The Modern Boy pre-dates the copy above by some eight years, being dated September 8th 1928. The cover also features a high-speed motor-car, this time in the form of the exciting Opel Rocket Car. A one-page article within the comic takes a look at "The Mad Motor" in more detail. One of the bravest - or most reckless - men alive stepped into the weirdest kind of car ever seen in Germany or any other country, switched on the electric current which set loose the propulsive forces of his fiery chariot, and was immediately smitten with a burning desire to get out of it again with at least a few of bones in his body intact! And no wonder, for the car was driven by rockets, electrically exploded, in the tubes in the tail of the chariot; and though he let off only a few of them, the noise, smoke, sparks, and speed combined to make him wish most fervently that he had never approached within a hundred miles of this amazing invention! As soon as he could gather his wits together he jumped on the brakes, and then and there declared vehemently that he had had enough! It "did" that brief spurt at the rate of sixty miles an hour. Apparently earlier un-manned trials of the rocket car on a stretch of railway line, saw it achieve a top speed of some 430 miles per hour. The tail rockets of the Opel were loaded with 750 pounds of gunpowder before the next test firing, this time "manned" by a cat in a bid to gauge how a human may cope with the terrific speed potential of the rocket car. Sadly this run didn't quite go to plan, once the initial explosions and sheet of flame had passed, the rocket car stuck to the rails for only 20 yards or so before veering off them, and piling into the ground nearby. The cat is said to have "disappeared", while the car "... was a candidate for the old-iron rubbish heap". Needless to say the 30,000 spectators who had gathered to watch the run left somewhat disappointed. At the time it was hoped that experience with the Opel Rocket Car would lead to developments whereby aircraft could be fitted with rocket motors, capable of 250 miles per hour initially, increasing to an estimated 725 mph while flying at a height of twelve to eighteen miles high. Despite the fiery ending of the rocket car, the inventor was still keen to pursue his experimentation, and there were plans to bring a Mk2 version of the Rocket Car to Brooklands at some point in the future. Fritz wasn't a stranger to exploding vehicles by this point in time either, for a rocket boat - secretly tested on the Rhine - also ended in tears it is said, flames from the burning wreck shooting ninety feet into the air. 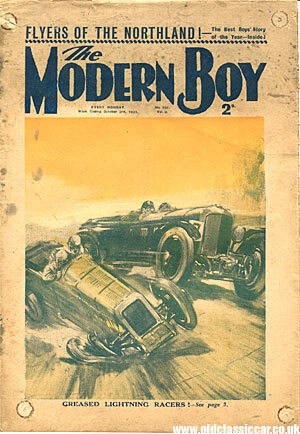 Several more copies of The Modern Boy turned up in recent times, all with motoring-related themes to their covers. This copy dates to week ending October 13th 1928, issue 36 of Volume 2. Two young chaps, one with car brochures poking out of his blazer's pocket, admire a sporting Bentley's mighty engine. Inside the front cover is a shot of Kaye Don driving his Lea-Francis on the International Tourist Trophy (TT) race in Northern Ireland, while facing it is a preview of what to expect at the upcoming Motor Show, to be held at Olympia. "There are cars at the show priced from a shade over a hundred pounds to amazing luxury vehicles which the price of fifty of the smaller machines would scarcely buy. In between them are semi-racing models and super-fast sports cars, and if you get on the right side of the salesman you can sit behind the steering wheels and imagine what these magnificent cars would be like to drive - at round about ninety miles an hour!" The preview is accompanied by a photo of an earnest gent, perusing the exposed chassis and running gear of an Austro-Daimler. Next, a later copy, dating to October 3rd 1931. An illustration of two "greased lightning racers" livens up the front cover, hinting at a feature by Arthur Edgar on the world of motor racing, Brooklands in particular. Illustrations of a Delage, flames pouring back from its bonnet due to fuel spilling onto the hot exhaust, and another of a tiny Austin 7 narrowly avoiding a track official, accompany the write-up. "... one driver of a racing Baby Austin opened the excitement of last year's race  by getting into a colossal skid near the grandstand. No one was able to count how many times he spun round and round on the track as he slithered towards the replenishment pits! If the concrete had not been flooded with water, the car must have turned turtle. As it was, the screaming tyres slid over the wet surface, and the machine finally stopped - after all but collecting a track official, who saved his life only by a goat-like leap." 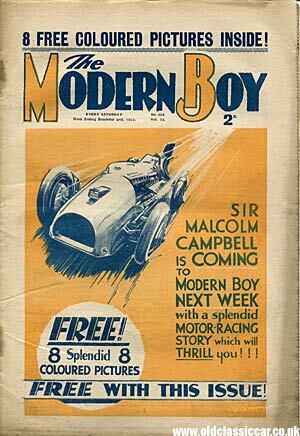 Sir Malcolm Campbell's Blue Bird, streaking along in pursuit of speed record glory, features on the cover of December 2nd 1933's issue, advertising an exciting feature due in the following week's publication. In the meantime, the keen reader of this week's copy received eight "splendid" colour photos, presumably of Campbell and Blue Bird. There are no motoring articles as such in this copy, although the exciting activities of "Horton the Dare", brave and fearless motorcycle messenger on board his new Norton International 490 motorcycle, should have kept most young petrolheads happy until the Campbell issue, due out the following week, was in their grasp. Return to the car collectables section, or read about other racing items here. 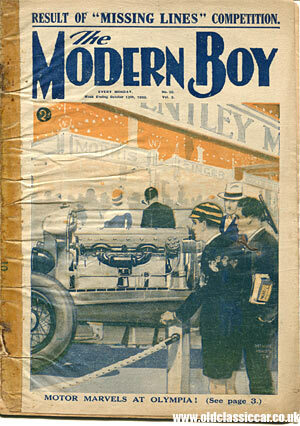 A booklet given away with Boys' Magazine in the early 1930's, all about motor-cars and boats, is described here.